Most of the people ask us that if they can get an online nikah form in Pakistan? The answer to this question is that they cannot get the online nikah form in Pakistan. There are many reason why online nikah form in Pakistan cannot be obtained. One of the reason is that this nikah nama form is issued by the provincial government with a serial number. A nikah registrar in Pakistan is issued a complete book of nikah nama with a serial number on it. Every book of nikah nama contains a 100 sets of nikah nama. Every set of nikah nama has 4 pages. For example serial number 44 will have four pages with the same serial number on it. Every nikah registrar has to keep all record of all pages and in case any set of nikah nama is missing or destroyed then the nikah registrar has to render the record to the local government that where and how the nikahnama got missing or destroyed. When an overseas Pakistani contact us for online marriage in Pakistan then we get a set of nikahnama issued in his name. Sometimes these overseas Pakistanis ask us to email the copy of nikah nama which is not possible because you cannot every time change the serial number of nikah nama moreover the paper used in nikahnama is not easily found. The paper used in Nikah nama is a double page of big size as such a big size paper cannot be easily found at stationary shops. The provincial government logo is also available on each page which cannot be printed with a local printer. For all these reasons when a overseas Pakistani for the purpose of online marriage in Pakistan call us for our services we post them the set of nikah nama as sending the online nikah nama form in Pakistan is not possible. For online nikah in Pakistan Nazia Law Associates is the best law form dealing in online marriage in Pakistan. 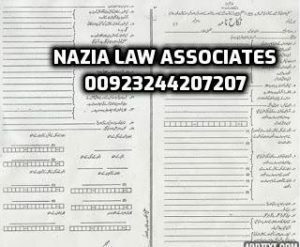 Instead on asking for online nikah nama in Pakistan please contact Nazia Law Associates, The best law firm for the services of online marriage in Lahore Pakistan. People from different parts of the world contact our law firm in Lahore Pakistan for availing the services of online marriage in Lahore Pakistan and the normal procedure for the online marriage in Pakistan is that either we required a power of attorney attested from Pakistani embassy abroad or post them the nikahnama forms from Pakistan. Sending online nikah nama form in Pakistan is not practically convenient moreover those who are providing an online nikah nama form in Pakistan are betraying their clients as mentioned above that the nikah nama form has a serial number and is issued from a nikah register on the name of the parties who wishes to have their marriage done. In Lahore Pakistan the nikah register is issued by the district local government and each nikah registrar is accountable for each set of paper of nikah nama.